Buttermilk for me, is quintessentially Irish. It’s one of the main ingredients in soda bead. In my research for this recipe, (YES- I do lots of research for you my loyal readers!). There are certain essentials that you don’t mess with- there is always an egg, baking soda, buttermilk, and flour. And depending on the recipe, are in different quantities. And with all baking, there’s a chemical reaction that takes place, to give the texture (hopefully light and airy bubbles), flavour and the colour. Known as the Maillaird Reaction, it’s this chemistry that gives the aroma and gorgeous caramel pancake colour. The secret to a successful reaction, is to have an alkali environment, that is , less acidic. Buttermilk, by it’s very nature, is acidic. So the addition of the baking soda neutralises this out. When you raise the heat on your pancake batter, the amino acids that make up the proteins begin to chemically bond with carbon and oxygen atoms from sugars. The end result is a complex brew of hundreds of different aromatic flavour inducing molecules, that give your food a distinctive and rich palette of flavours. Yum. Method: Whisk together the flour, baking soda, baking powder, and salt in a medium bowl. In a separate bowl, whisk together the butter, egg, and vanilla. Whisk in the buttermilk and maple syrup. Stir in the yogurt until no large lumps remain. Add in the flour mixture, and stir until just incorporated. Lightly coat a large pan or griddle with vegetable oil, and preheat over low heat. Using 2 tablespoons of batter for each pancake, dollop onto the hot pan, and spread into a circular shape if desired. 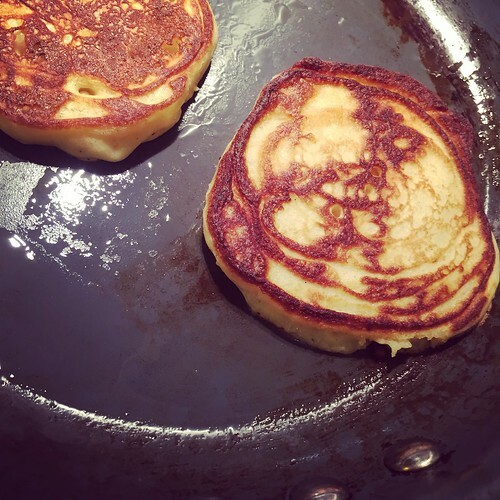 Let the pancakes cook for 2-3 minutes, or until a slight skin starts to form around the edges and the bottom is light golden brown. Slide a spatula underneath, and flip. Continue to cook for another 1-2 minutes or until light golden brown on both sides. Serve hot.